Hi everyone, this is Mr. KK, putting up a blog post for Kathleen . . . Thanks to all of you who subscribed to Kathleen Kirkwood's Mailing List - we sent a News Blast out to all subscribers yesterday. For those of you who would like to join, but haven't yet, here's the link to do so. 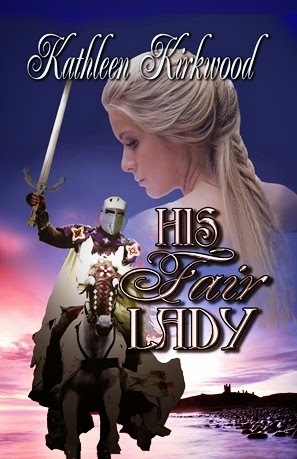 On the first day of Summer (June 21), we will be participating in All Romance eBooks’ (ARe's) Summer Promotion with SHADES OF THE PAST and HIS FAIR LADY. Those books will be on sale one day only and only through ARe at half price (for $1.99). So, if you or any of your friends have been eying either of these two books to purchase, this Saturday is the day to buy it from ARe (available in ePub or Mobi formats). Again, these books will be on sale only through ARe and only for one day – June 21). They will remain at their regular prices ($3.99) through all other vendors. A knight returned from Crusade . . .
A maiden robbed of her birthright . . . Mysteries to be solved . . .
Wrongs to be righted . . .
And love to be fulfilled, fated long ago . . .
A widowed Victorian Lady . . .
A mysterious Viscount . . .
A remote and ancient castle . . .
Where ghostly residents stir anew . . .